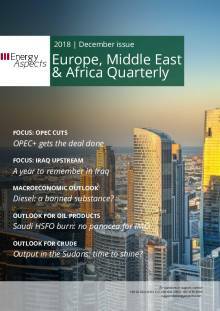 Our Europe, Middle East & Africa Quarterly (EMEAQ) provides comprehensive analysis of the EMEA region, examining key topics in depth and providing a detailed guide to regional supply, demand, trade flows and downstream capacity. Each quarter, ‘In Focus’ pieces delve into key issues that will impact the market in the near and medium term. In Focus: Iranian exports are set to drop sharply in the coming months, focussing the market’s attention on spare capacity—most of which is concentrated in Saudi Arabia. With the 0.3 mb/d Khurais expansion having started in Q3 18, the Kingdom may be able to sustain output around 11 mb/d but increases beyond that would need the start of the Neutral Zone. In Focus: Signs of Iran’s response to the full US sanctions regime are starting to emerge. Domestically, the key preoccupation will be securing regime stability by mobilising the population against an external enemy. Internationally, Iran’s response is likely to be restrained at first, turning more aggressive as its diplomatic isolation grows. Macroeconomic outlook: The loss of Iranian crude will have significant implications for trade flows, as Europe will have to replace 0.8 mb/d of lost supplies. While Europe will attract more Urals and Basrah Light, there are not enough sour crude barrels to go around, especially with China bidding it away. Outlook for oil products: Currently, the loss of Iranian and Venezuelan crude has tightened the sour crude market, even though the upcoming IMO 2020 regulation will weigh on sour differentials. With a little over a year to go until IMO kicks in, scrubber uptake trends suggest that HSFO will be widely available in the major ports, while smaller ports will see a tussle between MGO and VLSFO. Outlook for crude: The focus on spare capacity is all the more important as political and security risks across Libya, Nigeria and Iraq are all on the rise. In Libya, production has rebounded strongly to above 1 mb/d, but this will be difficult to sustain. NOC has successfully shielded the oil sector from the worst aspects of the conflict between various groups in recent years, but the general climate of political instability, budget constraints, insecurity and underinvestment are all likely to continue to cap production. EMEAQ also provides a unique and comprehensive overview of key regional data, focusing on: demand, refining, supply, trade flows and prices, including domestic consumption by country and by oil product for key European, Middle Eastern and African countries; refining capacity and upcoming projects by country; refined products output; and crude output by country, with a detailed focus on the largest regional players. Our Europe, Middle East and Africa Quarterly (EMEAQ) provides comprehensive analysis of the EMEA..
Our Europe, Middle East & Africa Quarterly (EMEAQ) provides comprehensive analysis of the EME..